How does one describe a good fishing rod to someone with just words? 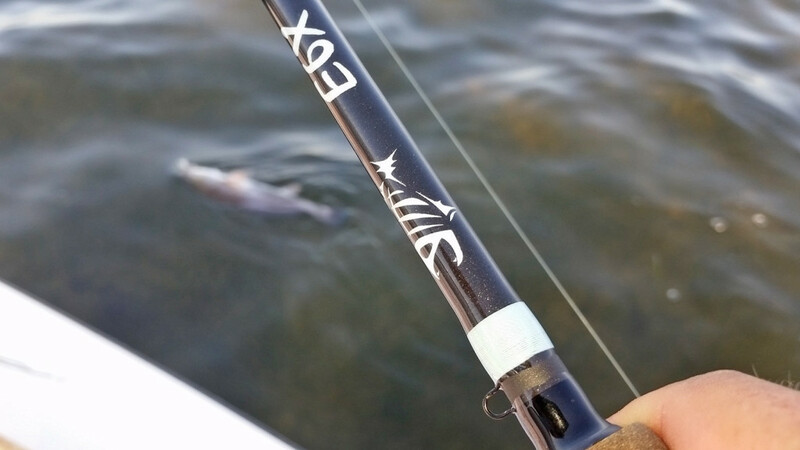 The fish pictures help, but the essence of quality and the difference it makes is so ethereal that it is certainly a challenge to describe, but I will give it a go for my recent trial of the G. Loomis E6X inshore rod. 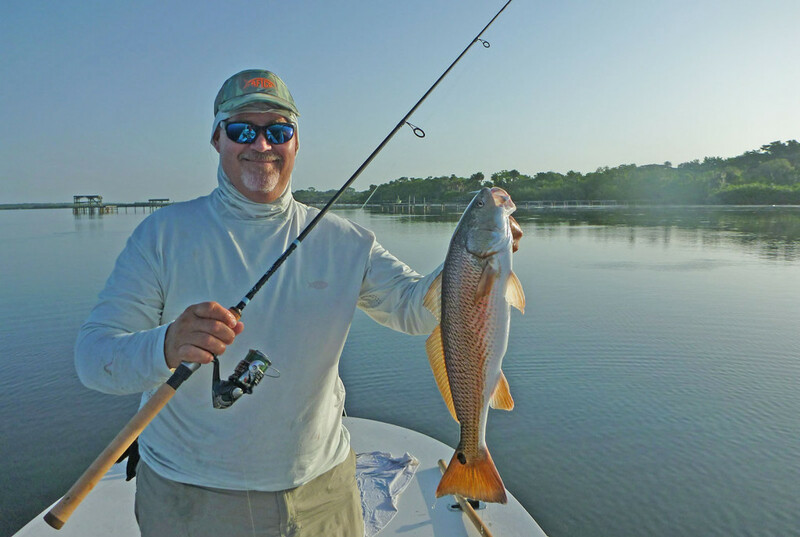 Yes you can catch a fish on just about any rod you can scrounge up, but as one gets deeper into the sport or a specific fishery, the qualities of the rod come into play. The action, length and components like guides and reel seats all play a big role in how the rod feels and functions. 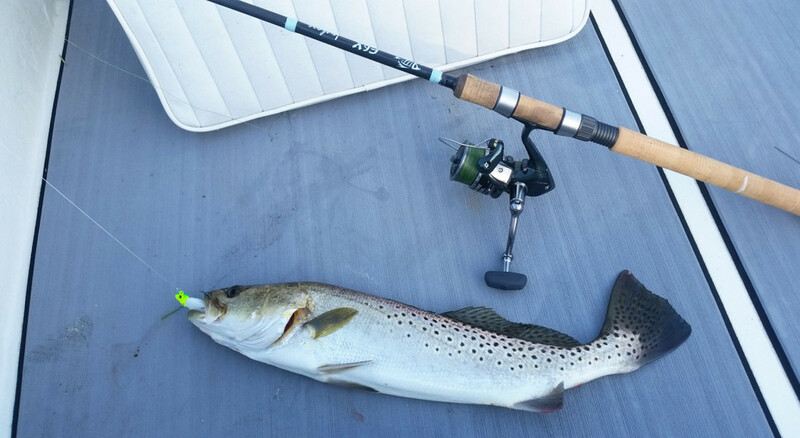 The finer points can best be appreciated if the rod is in your hands and more so if you are fishing with it as opposed to whipping it around in the aisle of the local sporting goods store. I’ve been on a mission to revamp my inshore equipment after a long pause for lots of offshore missions. I’ve had quality rods in the past, but so often I’m finding that the products of today benefit from much improved technologies in just about every aspect of a rod. From high-tech blanks to indestructible guides, today’s rods are incredible tools for catching fish. 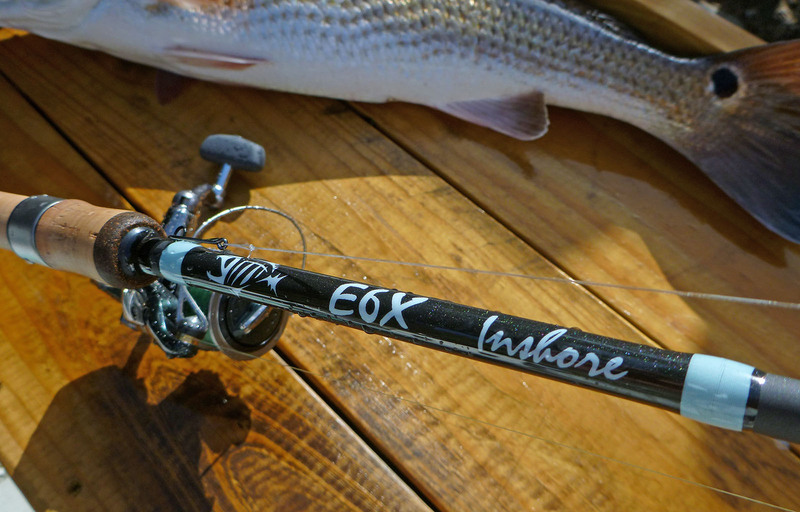 So I was not surprised when I tried the new G. Loomis E6X Inshore rods in my local fishery, the Indian River. I paired the new rod with a Shimano Symetre FL spinning reel, which is a really good reel for the money. The setup felt good in my hands. Smooth, light-weight, and balanced. Even while spooling it up in the garage, I was amazed at how sensitive this blank felt. I threw some 10-pound monofilament on it in a hurry with the mental note to get some light braid in the near future to try as well. Lately, most of my fishing consists of two-hour adventures before work. I slip out before daylight and make the most of the quickly passing minutes. I tied on a Mustad Shad Darter jig head and impaled a Berkley Gulp Shrimp on the ever-sharp hook. I use this setup to fan-cast the flats and work under the docks looking for a willing adversary. 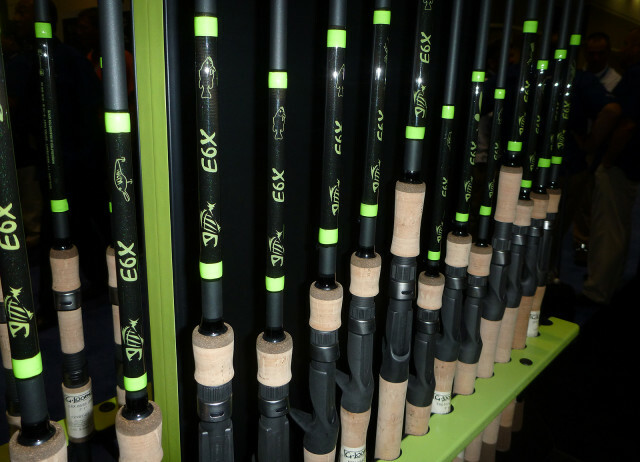 The new E6X rods benefit from G. Loomis’s Multi-Taper Technology. This combined with the sensitive and crisp E6X blank material makes a super light-weight yet very powerful set up. I had chosen the E6X 902S XF, which is a 7’6” version for 6 to 12-pound test and an extra-fast action. 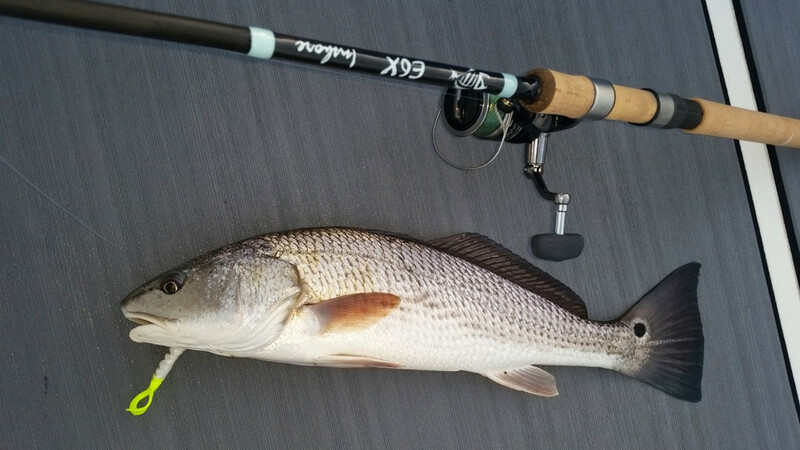 The 7’6″ E6X lets me make long casts with smaller lures to our naturally skittish fish like redfish and trout. This rod has just the right amount of tip for sensitivity, yet plenty of backbone to set the hook and turn a fish if needed. Often I have to lean hard on a fish in a do-or-die attempt to keep them out of the barnacle encrusted dock pilings or mangroves. Even on the open flats, a fish can bury up in the grass and some backbone is required to get them free. 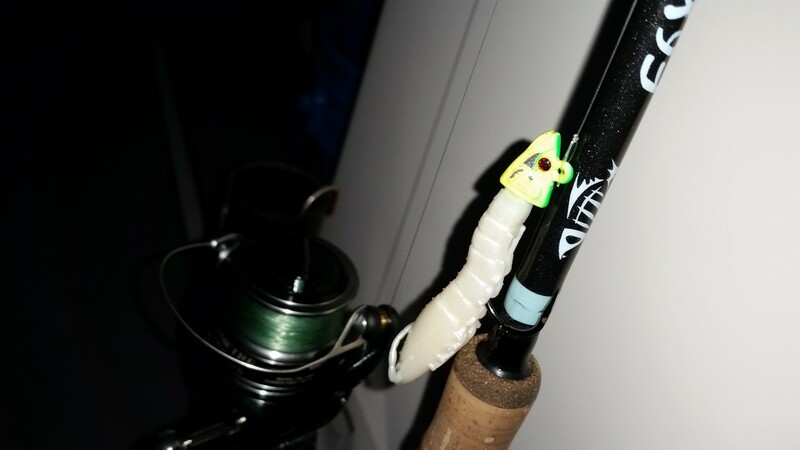 This rod has that backbone without giving up the light tip that makes it sensitive. I cast the jig and Gulp combo out and crank it back while imparting a slight twitch and pause. You have to keep the lure above the grass at all times or the rest of your cast is fouled by weeds. 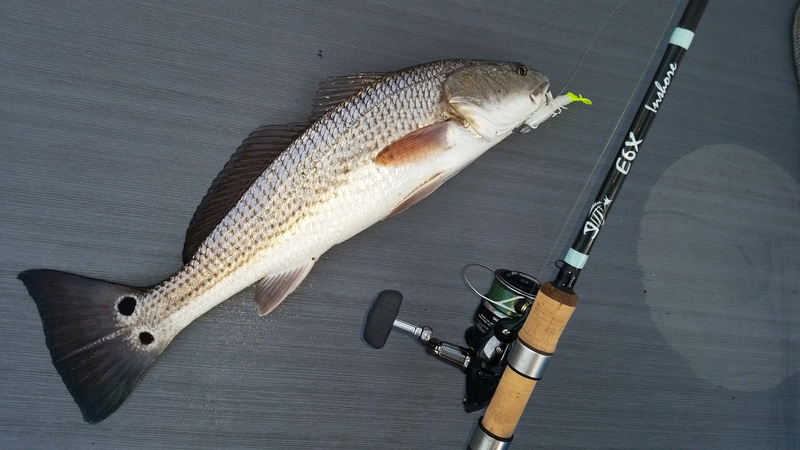 Suddenly the jarring bite of a frisky redfish was transferred down the rod and into my hands. A swift hook set and the fight was on. The drag on the Symetre is very smooth and the outfit performed flawlessly. 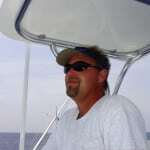 Soon the redfish was aboard for a quick picture with my new outfit. Of course it takes more than one fish to become tried and true, so I continue to use the E6X every chance I get. 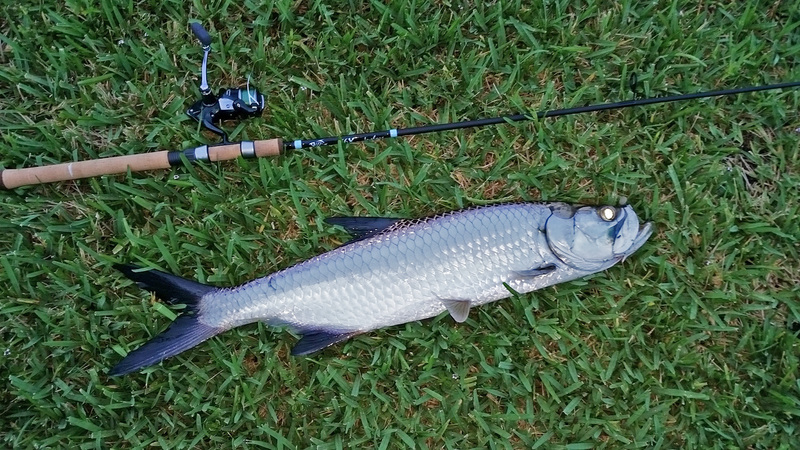 If I don’t have time for the boat, a quick cast or two during lunch never hurts and the local juvenile tarpon are great fun on this rod. I can throw the tiny lures required to mimic the two-inch mosquito fish that they grow fond of eating in our creek. This is where the rod length and the guide system come into play to extend your casting range. I did eventually get some braid to put on the reel, which increased the sensitivity, even more. I can feel everything now. Just this morning I threw at the slightest movement in the 20-inches of water I was fishing and wham, a nice seatrout inhaled by Gulp offering and actually jumped like a bass about three times. I hope that I have been able to give you the idea of what a great rod the G. Loomis E6X is and I’m not the only one to be impressed. The judges at this year’s ICAST tackle convention gave the E6X’s freshwater cousin the Best in Show Freshwater Rod for 2015. The G. Loomis E6X series includes a wide variety of models to match your specific fishing needs.